I'm looking for a faux or real fab necklace on a $500 budget. Why $500? 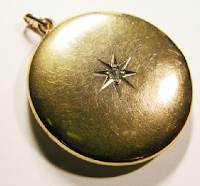 Because I saw this "Heirloom octagonal locket", $495 at J. Crew and thought I could do way better that this little overpriced 10k trinket. I will wear costume, but generally look for vintage, because current costume disappointing, with a few exceptions. In vintage, several costume pieces stood out. Add '50s flirt to a jacket or cashmere sweater with this gold mesh necklace intricately embellished with two turquoise and ruby tassels and one medallion. 16" long. 3 1/2" long tassel ends. Price, $200; from Ellen Wood Scarborough, on the 1stdibs site. 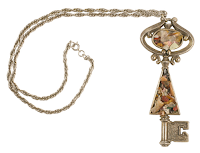 Art stone encrusted large key pendant necklace in silvertone. 24" long. Key is 4 1/2" long. 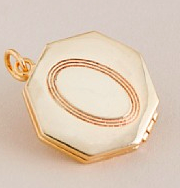 Way more original that a Tiffany key pendant, and the price is $150; also from Ellen Wood Scarborough. When I begin to shop faux, I so often end up with a pleasing 'real' piece. Chrysoprase Filigree Necklace, ca. 1940 An Art Deco dream. 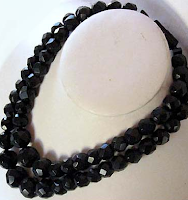 Silver chain necklace with black beads interspersed throughout. 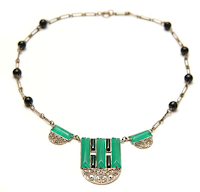 The center has a large pendent in silver filigree work and bars of black glass and chrysoprase. 17" long, pendent is 1 1/2". Circa 1940. $550 from Carole Tanenbaum Vintage Jewelry. Fifty bucks over my budget but glamourous and special; worth the splurge. 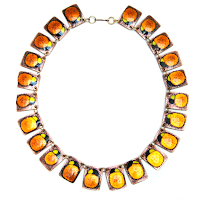 Necklace of rectangular copper links embellished with orange and yellow enamel work, circa 1950. Links are joined by copper findings. Size is 20” long, 1” wide. From Carol Tanenbaum. Just a tad over again at $550, but what a piece: enough drama for a jacket but hip enough for a black tee with jeans. Or two lavish strands of Victorian Whidby jet, beautifully-cut beads for $350, also from Deja Voodoo. The strands are 16" and 18 1/2 inches, and the beads are good-sized, the smallest is 13/16" and the largest, just under 1/2". 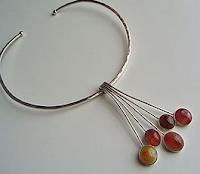 A superb and versatile Modernist piece: Jane Widberg mid-century sterling and carnelian necklace composed of an pendant (which could be worn on a longer chain) and neck-ring, $495 from Auerbach and Maffia. You can even get a diamond-set locket on this budget. 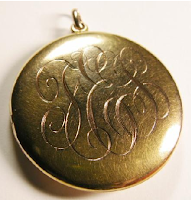 If I were craving a locket, I'd choose a ca. 1900 14k rose gold piece from Ruby Lane seller Eve Dove Gems. It has a 10-point diamond set on one side and a lovely monogram on the other, and still contains the Gay Nineties photo of a couple inside. Price, $295. Quality, schmality. Sometimes you have a better use for your 500 clams and want a vibrant new accessory for a party or two. There's a time for fake and fab, usually late at night under a restaurant chandelier. Something hip for a night out: this Aldo fuschia Dark necklace delivers colour, pearls, and dripping Bollywood tiers, all for $25. 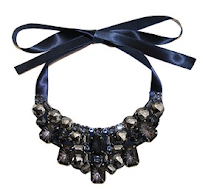 Navy is a nearly impossible colour to find in jewelry, so I was captivated by this navy Rhinestone Bib Necklace, the kind of accessory that revives a dress or top you're used to. $59 from Art Effect, and also available in black. Catherine Stein 30" multicolored bead baubles strung on ribbon look very good indeed for $35. From Lord and Taylor. 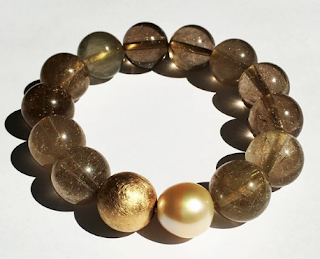 RJ Graziano is another costume-jewelry designer who creates outstanding lower-priced pieces. This smoky gray resin and chain necklace piece is as bold and well-balanced as pieces at quadruple the price. Also available in clear resin, but get the moody, richer-looking grey. $75 from Bloomingdale's and also sold on HSN. In general, I dislike faux anything. I´d rather be without than wear something not `real´. But- there is one exception! I have a great funky necklace by a Swedish multi- designer, who uses unbelievable combinations on her jewelry. I won´t even try to explain her works, too difficult. They are something you either love or hate. I wish my clothes to be real too. And when the quality is perfect, you feel and know it. I´m sure you Duchesse understand. My rule when shopping for clothes or jewelry is that each piece must be able to stand on it's own. I won't buy something I don't love just to complete an outfit. I agree with metscan, better to go without than to compromise. However, what you love is as individual as who you are and that's where we all get to show off our individuality. Sometimes I enjoy the kitsch of obviously fake pieces. At other times, I want the real deal. It really just depends on my mood. metscan: I've come to embrace resin for big pieces- it's light. I don't like imitation gems nearly as much, and faux pearls are shiny rather than glowing. lisa: That's good advice. I would not go without either- there are pleasing pieces in real materials like wood or shell that are not costly. Pseu: Jet is undervalued, and well cut beads are marvelous. What fun! I'm sorting through what I have to go with a black velvet dress for the holidays -- trying not to be tempted by your fabulous array. Your jewelry posts always help me think about how and what I wear, and I thank you for helping me become a bit more sensitive about what works and what doesn't. Love the fun options that you have found. 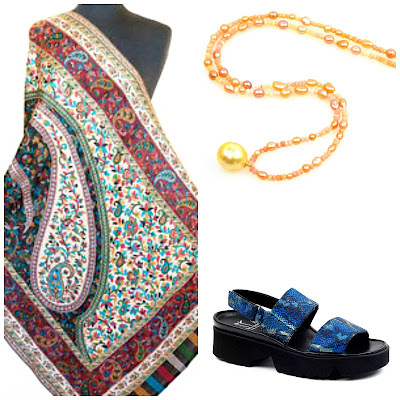 Vintage is definitely a greener way to shop too, so it would be a splurge without the guilt! Have you chosen one yet? I don't get why the J Crew piece is so expensive--once again you've shown that one can buy better for much less! nanflan: I know, it's weird as I don't consider their clothing overpriced. My guess is that their target market is young and relatively inexperienced shopping for 'real' jewelry. There are a lot of new overpriced pieces I am seeing that remind me of vintage Miriam Haskell from the 40's and 50's. You can find a lot of her companies pieces on Ebay. materfamilias: You have some wonderful things to choose from. lordfam: After writing this I found a top for New Years and am absolutely stuck for jewelry as it is a departure from my usual palette. Robin: The authentic MH is well-known and no bargain on eBay but looks better than the new stuff- much of which looks tangled-messy to me and will be out of style by end of next year. Beladora2.com, the less expensive website from the Beladora group, has LOTS of jewelry under $500. Just click on the Jewelry Under $500 tab. Fine estate jewelry under $500 there's plenty of it out there. Belle: I know about it but thanks so much for making sure all readers do. 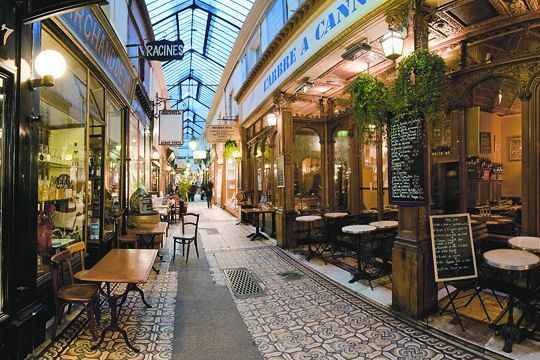 Everyone, Belle has a great eye and there are many treasures on Beladora2. 1.) The Deja Woo Mexican piece. That's just in case you wanted an opinion. As long as you're not looking for diamonds or other tres expensive baubles, there are heaps of gorgeous, well made options under $500. Tishjett: Thanks, I bounce between the amethyst and the chrysoprase depending on the day. I'd like to see the amethyst in person to judge the saturation of colour. Hi Duchesse. I'm developing a bit of a craze for cufflinks and am about to have extra holes put in the cuffs of some of my blouses in order to wear a small mother-of-pearl and gold pair that belonged to my grandfather. I think the seed of the idea was planted years ago when I inherited them, but I've become proactive since seeing the wonderful film 'Coco avant Chanel'. For all her faults, she was definitely a woman with an eye for costume jewellery! greying pixie: I love French cuffs, especially generous ones! My problem is that I'm lazy about ironing blouses and refuse to send them out- the laundry ruins them sooner or later. Your cufflinks sound charming; wearing family pieces gives pleasure and fond memories.